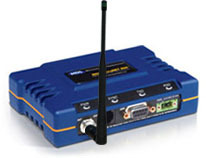 MDS TransNET Model EL805 Radio Modem, Long Range (up to 30 miles) and High Speed (up to 115.2 kbps) Serial Communications with FHSS (Frequency Hopping Spread Spectrum). 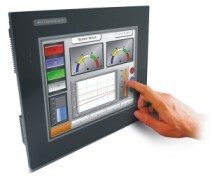 Provides data communication for nearly all SCADA, telemetry and EFM protocols (including MODBUS). CSA Approved for Class I, Div 2, groups A, B, C and D.
Today�s SCADA and Telemetry systems transport large amounts of data at ever-increasing speeds. Additionally, the need for greater packaging flexibility has redefined the �ideal� wireless platform. The MDS TransNET TM utilizes FHSS (Frequency Hopping Spread Spectrum) to provide reliable long range data transportation at up to 115.2 kbps. The TransNET provides transparent data communications for nearly all SCADA, Telemetry, and EFM protocols including Modbus. Any MDS TransNET may be configured as a repeater to extend the operating range of the network. Multiple repeaters may exist at any level of the network preventing a single radio failure from disabling the entire network.